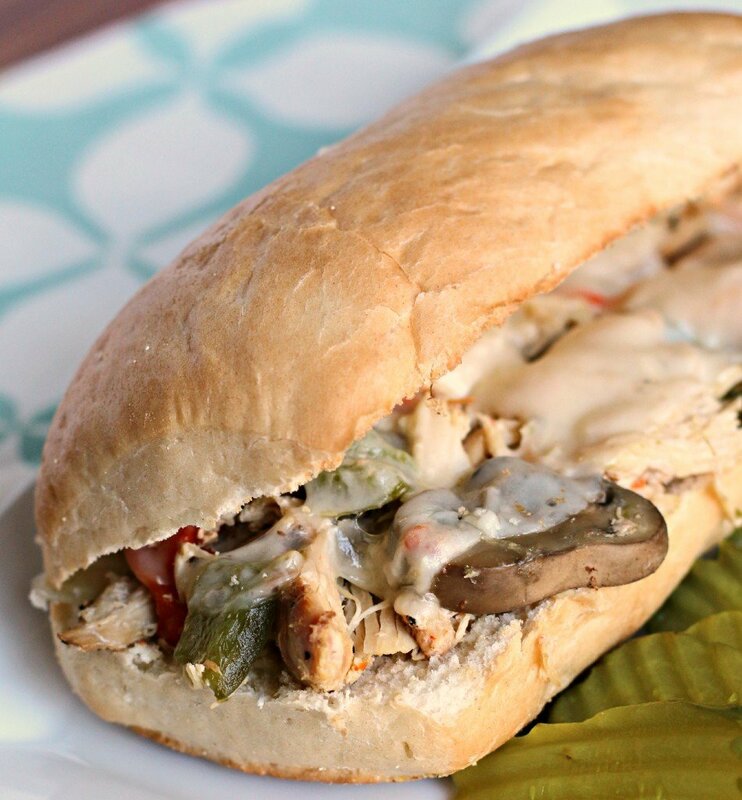 This week I made a healthier recipe- Slow Cooker Chicken Philly Cheese Steaks. 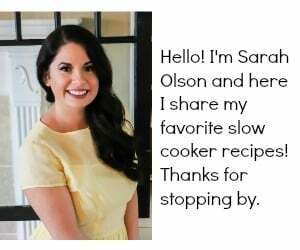 I have always wanted to make these in my slow cooker, since I adore my other sandwich recipe Slow Cooker French Dips, I knew these would be good too. My main goals for this recipe was to 1. make it easy. And 2. 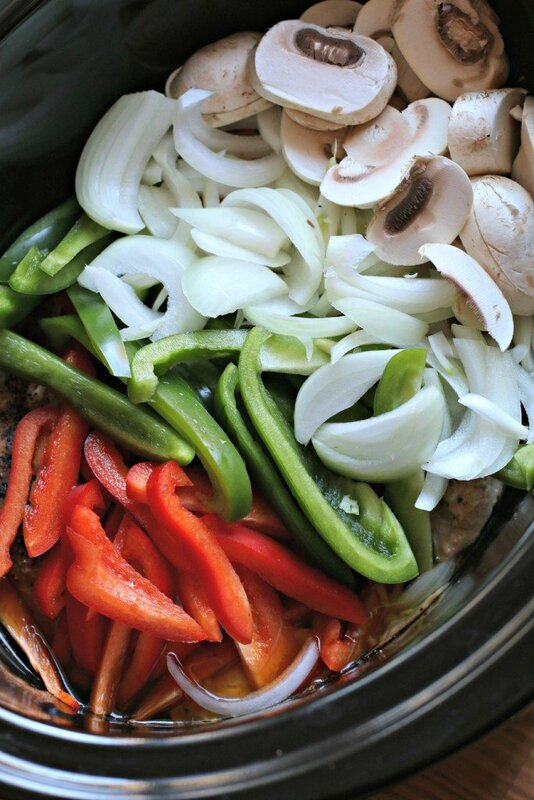 Keep the veggies from disintegrating in the slow cooker. I added the peppers, onions and mushrooms during the last 1.5 hours of cooking time. The veggies cooked up perfectly during the last 1.5 hours for these sandwiches. If I had added these veggies in the morning, they would of been mush by the time I got home. After the veggies cooked, I shredded the chicken with 2 forks. Then piled up the chicken and veggies on hoagie rolls, added Swiss cheese, then placed the sandwiches under the broiler in the oven, just for a few minutes. Place the chicken breasts into a 4-quart or larger slow cooker, and pour over the chicken broth. Season the chicken with the salt, pepper, garlic powder, and paprika (DON'T ADD THE VEGETABLES YET). Cover and cook on Low for 6.5 hours. After the chicken has cooked, add the sliced vegetables on top of the cooked chicken. Cover and cook on HIGH for 1.5 hours more. With 2 forks shred the chicken. Using tongs place the meat onto hoagies (tap as much liquid of the meat before placing on the bread), and top with cheese. Place the sandwiches open-faced under the broiler in the oven to toast the buns and melt the cheese. Note- This recipe can be adjusted for the length of time you won't be home. Example: Cook the chicken for 8 hours on LOW then add the veggies and cook for 1.5 hours more on HIGH. I am definitely making this! Looks so yummy. I love that this is made with chicken! I have to try it that way! Great recipe! Great idea on adding the veggies at the end of its cooking cycle. I need to make this and your French Dip! These cheese steaks look and sound amazing! And I LOVE that they are made in the slow cooker. 🙂 These are definitely getting added to my weekly meal plan soon. I love all the veggies you added. It is the best advice for increasing the nutrition in a recipe. Need to put these on our dinner menu. I never thought to make Philly Cheesesteaks with chicken! Genius! and what a great tip about adding the veggies later in the day. I know my husband would love these, so I’m going to have to add them to the to-do list for sure! 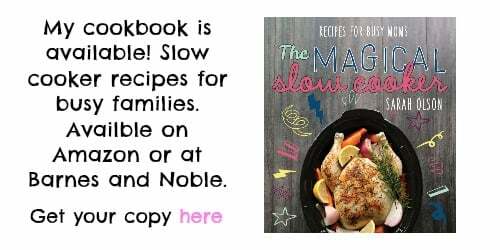 What a great idea to use chicken, and to make it in a slow cooker. Great recipe. Looks soooo yummy, I’m hungry now! Hi! I was wondering what that nutritional value was of one serving? Actually made this last night as written, and the veggies were a good texture at an hour on high. Next time I might leave my crock pot on low to cook the veggies, since it’s newer and holds the heat very well. I added about 3 TBSP steak sauce (A-1) to the chicken broth step to cook my chicken, and this was GREAT! Definitely a keeper recipe!!! Hubby had 2 sandwiches, so that means it was a hit. We added sliced cherry peppers to the sandwiches for a nice tang. This a yummy and easy dinner!! Put everything in the crockpot this afternoon and now ready for an awesome dinner. I was skeptical that the seasoning would be flavorful enough, but it is perfect. 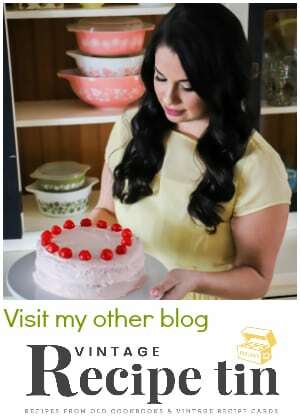 Joined a couple weeks ago have done many of your recipes(dinners) mostly..alls I can say is wow there faboulos. 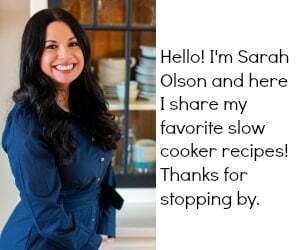 Thank you for sharing never knew all that can be done with a crock pot.great work Sarah. Glad you are trying the recipes Lisa! thanks for the kind comment!